Our vehicle's suspension system (i.e., shocks or struts) is something we often take for granted. However, after supporting several tons of metal year after year, eventually the shocks will wear out and suspension repair will be necessary. Some people mistakenly believe the suspension is mainly about having a smooth ride, and therefore these repairs aren't as important as other maintenance issues like oil changes or brakes. However, having a bad suspension can greatly affect your ability to control the vehicle, especially when stopping or turning, so it's in your best interest not to ignore this part of auto maintenance. How do you know when it's time for suspension repair? Your vehicle will usually tell you. Here are six things to watch for. Most people can tell their shocks or struts are wearing out when they begin to feel every bump in the road, or when every bump causes the vehicle body to "bounce." A rough ride is an obvious sign that your vehicle's suspension needs work. With a failing suspension system, you'll often feel the vehicle "drift" or "pull" when you're turning. This basically means the shocks are no longer keeping the vehicle body stable against the centrifugal force of a turn, increasing your risk of a rollover. If you feel this sensation while turning, it's time to take the car to a trusted auto repair shop for servicing. When the shocks are worn out, you're likely to feel the vehicle body lurching forward and downward nose-first when you apply the brakes firmly. This can actually affect your ability to stop the car quickly (a bad suspension can increase stop time by up to 20 percent). Take a look at your tires. If you notice the tread is wearing down unevenly on your tires, or if you notice balding spots, this is often a symptom that the suspension isn't holding the car evenly, and therefore putting uneven amounts of pressure on the tires. If you can look under the vehicle, take a look directly at the shocks or struts. If they look greasy or oily, there's a good chance that they are leaking fluid and therefore aren't working properly. It's probably time to get those shocks replaced. 6. Try the "bounce test"
If you suspect your suspension is going bad (perhaps due to one or more of the symptoms we mentioned above), try this simple test. With the car in "park," press down on the front of the vehicle with all your weight, "bounce" it a few times, then release. Do it again on the rear of the vehicle. If the car continues to rock or bounce more than 2-3 times after you release it, the suspension is wearing out. 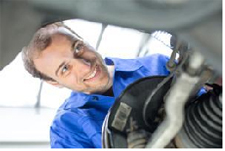 For expert auto repair in Mountain View and Palo Alto, trust the ASE-certified experts at The Car Doctor. They have built a solid reputation for excellent customer service and trusted repairs at affordable rates, even offering special offers online for additional savings. For a free quote on suspension repair or any other auto maintenance needs, they can be reached at (650) 492-6853.